The current bull market has reached the point where it is just as long as the great 1920s advance. And the market is at new all time highs. The recent run-up has not been nearly as spectacular as the final push in 1928-29, but the price pattern still shows a nice similarity over this entire period. Daily price action doesn’t get much more similar than this, especially in the final 7 months. A six month sideways phase gave way to a final rally that lasted a little over three months. Even the smaller six weeks sideways before the final three weeks upward thrust to the top gets repeated. If this is not a mere coincidence then we are now within days of a major top. The gains are smaller (which is not abnormal in a bull market that “only” triples from its starting lows), but the price pattern is almost a photocopy. What could go wrong? Well, it’s never good to get married to a price pattern. There is also another possibility to consider here. In the 1920s the final runaway mania stage didn’t start until the Fed had really started hiking interest rates several times in a row. Bonds are not a place to be when rates are going up (which pushes bond prices down), so more investors started getting into stocks (which happened to be going up every day, making them hard to resist). This time the Fed has waited longer to hike rates, so the final runaway stage may just be getting started now. We will know if the market keeps going up in March and April. In the 1920s an acceleration came once the market had more than tripled from its lows and we are now very close to triple again. This could be a sudden “phase change” just like water starts cooking at a certain temperature. Vapor behaves differently from liquid water, and just so a market that goes into blow-off mode behaves very differently. Buying begets more buying and people who stayed in bonds start feeling stupid compared to their friends who are driving nice new cars they bought on the back of their stocks market gains. It starts feeding onto itself. Sure, some people will keep warning about overvaluations. But investors won’t listen. Why not? Because it is well known that most investors suffer from “superiority bias“. Just like almost 90% of drivers think they have above average driving skills, investors typically believe they have above average investing skills. If you happen to think that your investing skill is below average then you will probably keep your money in a savings account, or hand it over to a money manager (who is usually having even more superiority bias than a retail investor). The result is that participants in the stock market are almost invariably believing that they will be able to get out before stocks go down. This may happen again and we are probably close to the point where this phase change can start. Why is the stock market so depressed? Why is the market so depressed? That may sound like a funny question, because more than a few observers want us to believe that stock investors are becoming euphoric after 5 years of ongoing bull market. But is that so? 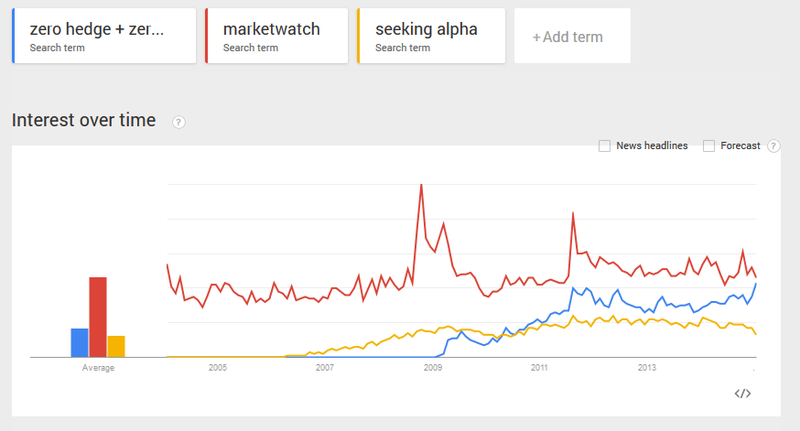 Where are the signs of retail investors becoming euphoric? Or is it conjecture based on the fact that stock markets are at record highs once again, and hence investors are “supposed” be euphoric right now? I couldn’t escape seeing some of the S&P 500 forecasts for 2015 and was surprised at how subdued they are. Market strategists at Goldman Sachs, Barclays and Credit Suisse are expecting S&P to end the year at 2100. Deutsche bank calls for 2150. Citibank and BoA are more “optimistic” calling for S&P 2200 by the end of 2015. But hey, the S&P 500 was already close to 2100 in the final week of 2014. So, all these major banks are basically calling for stocks to be mostly sideways and barely end the year in the green. It is very rare for these major banks to call for a down year in stocks, so when they predict a flat year it is about as pessimistic as they ever get. If the average investor is becoming euphoric, then why is an overly bearish site like Zerohedge attracting more and more readers, to the point where it is almost overtaking Marketwatch? If the average investors is becoming euphoric, then why is Seeking Alpha, a site with a generally bullish slant, seeing a accelerating decline in interest? It’s hard to envision how more and more overoptimistic and overextended bullish investors would suddenly want to read the apocalyptic perma-bearish stuff that zerohedge cranks out on a daily basis. Notice how zerohedge previously had peaks of interest in November 2011 and June 2012, right when stocks were at important correction lows just before embarking on major rallies. And then I also noticed articles like this: 11 Economic Disaster Predictions From Experts Around The World For 2015. It looks like you have plenty of company if you are pessimistic for 2015. Bottom line: the current google trend readings are more consistent with a pessimistic/depressed mood in the market, and so are the bank’s subdued forecasts for 2015, and fear/depression views still sell like hot pancakes.. Hence the title of this blog post: why is the stock market so depressed? Possible answer: because the media has drilled us with the consensus view that end of QE and the Fed raising interest rates in 2015 will knock down the stock market. Maybe so, but then we better also ponder: when was the last time that a consensus bandwagon offered an easy ride to investment profits? The market is starting the new year with a pullback. Moves on the first and last days of a year are generally rather meaningless. This pullback is probably testament to a bearish mood, with some investors having waited to take profits for tax reasons. We remain in a lunar red period until later this week and technically my Earl indicator is pulling back with the slower Earl2 being on neutral. 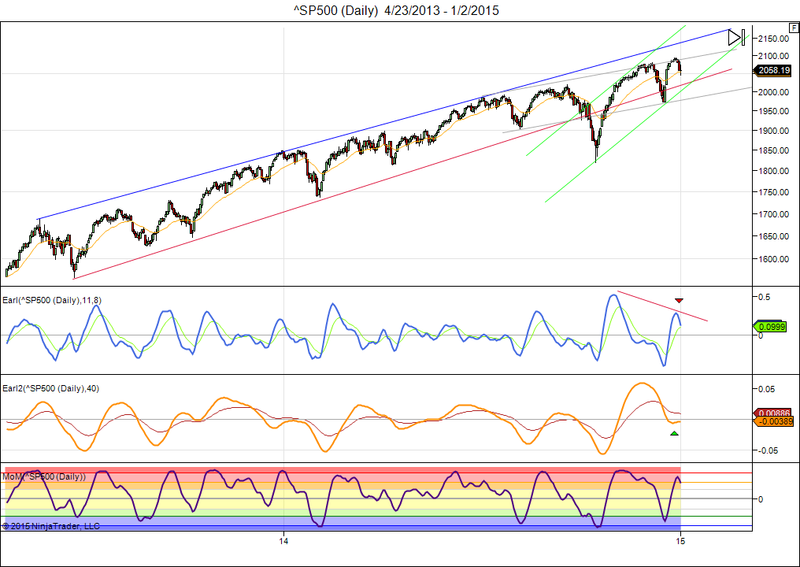 We could easily retest the 2000 level and if the S&P drops even lower then more bearish scenarios will come into play. Until then this is just a slow start to the year. 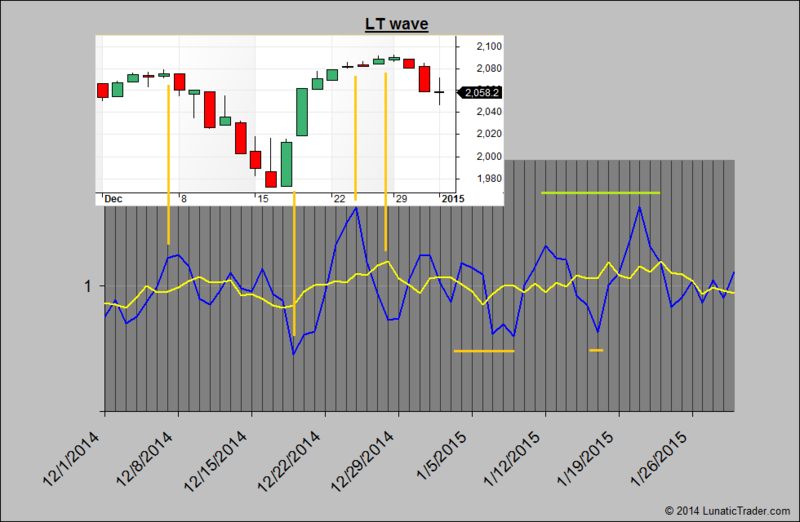 The LT wave did very well in December. The overall moves matched the expected pattern quite closely. For January the projected pattern calls for weakness until the 9th followed by a stronger period until the 23rd. This stronger period has a quick dip in the middle, around 16th-17th. The 17th is Saturday, so it may carry over into a weak opening on Monday 19th, from which market “should” recover. Last week of January is again weaker, but not overly negative. The Dow 32000 scenario continues to stay in the race. 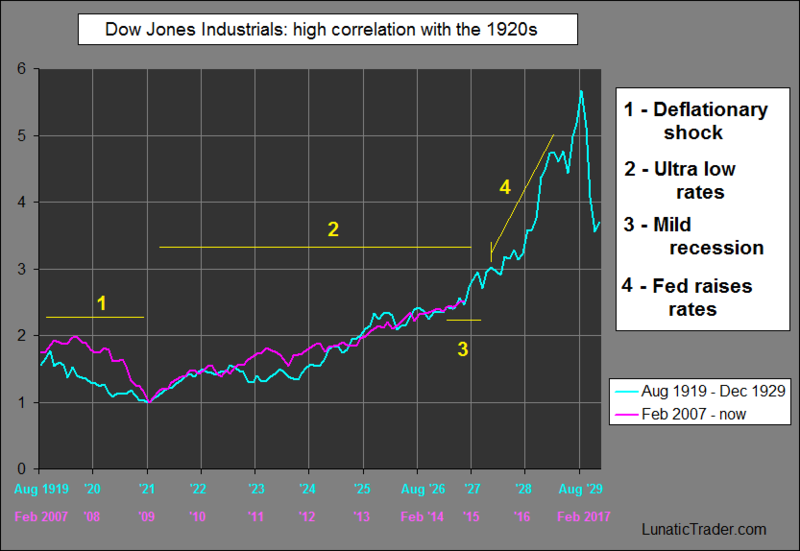 Since my most recent update the correlation with the 1920s has increased even further. If the scenario is to remain on track, a big “IF”, then the Dow should now climb above 20000 and then sputter for the rest of the year. The Fed would then raise rates in an attempt to stop a developing stock mania, and if that works as well as it did in the 1920s then it will have the opposite effect and push stocks up into a final blow-off peak. Instead of putting the blame with their own failed policies, they will conveniently point to algos and speculators as the causes of the mania and crash. But, that’s premature. Let’s first see if, when and how the market deviates from this scenario. It is going to be interesting no matter how it pans out.